Got some complaints over the way I had the files uploaded, so here is a new link to a different website to download the files. Well, I got a game menu set up, and the fundaments of a stat system done today, as well as having gotten the text output box done last night. The menu took forever and a half, but it works pretty nicely I think. Tomorrow is the last day, and there are still a few things I want to add. I want to get the stat system to the point that the stats actually do something, I want to add the Alpha Trooper as a wield-able gun, and I want to do some touch ups on the menu and the game end. I expect to get all of that done tomorrow, and then work on the zombie ai if I still have time after I get that done. I may update another time today, but I am taking a break at least from programming today. I did a fair bit today, most of what was on my to do list from yesterday. 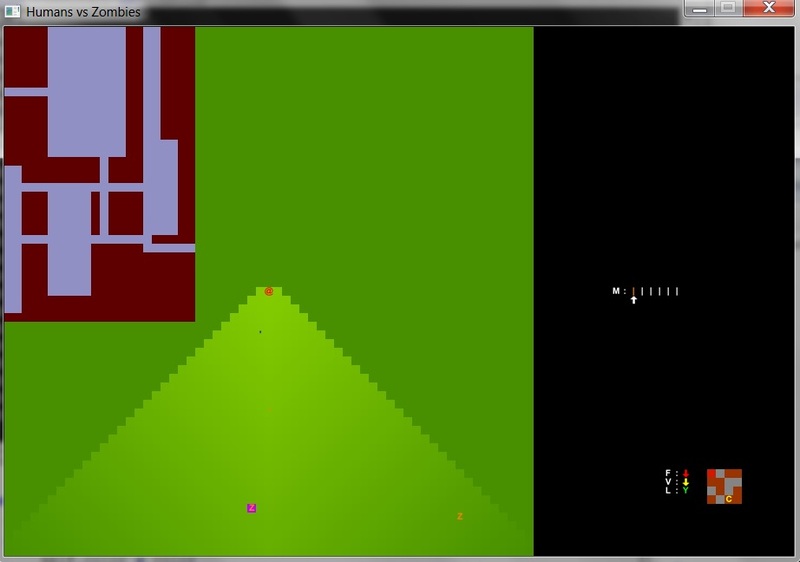 Running is implemented, and the zombies are a bit smarter, though not as much as I want. You can hear zombies that are running, so they show up on the map even if they are out of your line of sight. Still to do, is more nerf guns, a text output system and a stat system, as well as a nice game start and game end menu sort of thing. Might work on the text output later tonight, but for now I am off to update my neglected pokemon tabletop forum. With today’s additions, I feel that I could call this game complete. It now provides a mildly enjoyable experience based on resource management, running away from zombies and shooting them. Basically what I implemented today was a targetting system in which you choose which zombie to shoot at, a nerf gun and the nerf darts. It is now possible for you to fight the zombies by stunning them with Darts. There is a finite supply of darts, and so in order for you to keep shooting zombies, you need to keep picking up your darts. Another change that occured today was the way that movement works. You now pivot with the left and right arrows and move forward or backward with the up or down arrows. The num pad meanwhile lets you look in a direction that you are not facing. Here is a screenshot of my newest version. 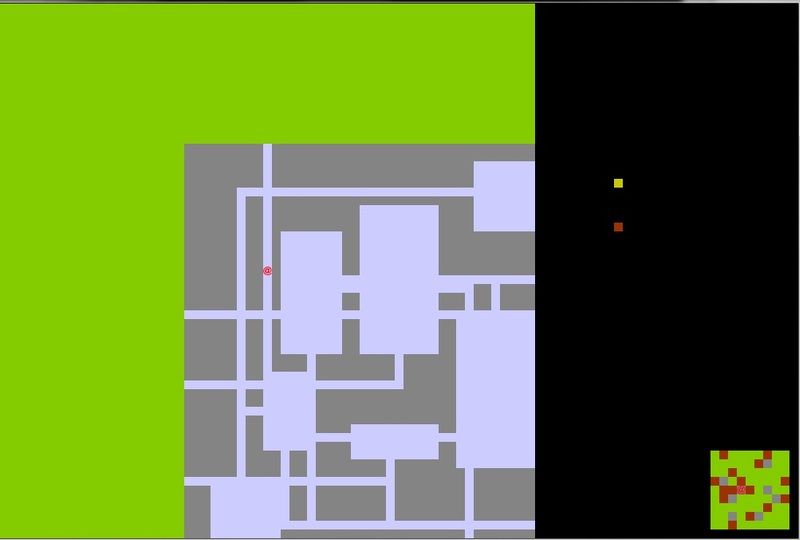 The zombie with a purple square is currently targeted. The little blue and orange specks on the ground are nerf bullets, and the menu area keeps track of which barrels have what kinds of bullets loaded, and which barrel is currently the active one. While the game is sort of complete, there are still many features that I want to implement before I feel like it will be acceptable. I would like to add in three or four more kinds of nerf guns to the game. I would like to implement a stat system. I would like to implement running as something being different than walking. I would like to improve the zombie ai. I would like to add a hearing system. I would like to add a way to generate text in the menu that is not dumb. Anyways, I still have several more days, so I should be able to get a lot of that done. I got the basic things that I wanted to get done today done. The vision system is more or less complete. This took the most time of anything so far and implementing it helped me learn a fair bit. I also implemented zombies today, that will try and chase and kill you. All in all the game is shaping up nicely and I hope that I will be able to add in some of the features I did not expect to get done in the coming days. Tomorrow will focus on the nerf guns and darts, and after that is implemented the game will be a complete game, with the rest after that just frosting. Of course a lot of that frosting is some of the most interesting and innovative parts of the game, so hopefully it is not sucky frosting. 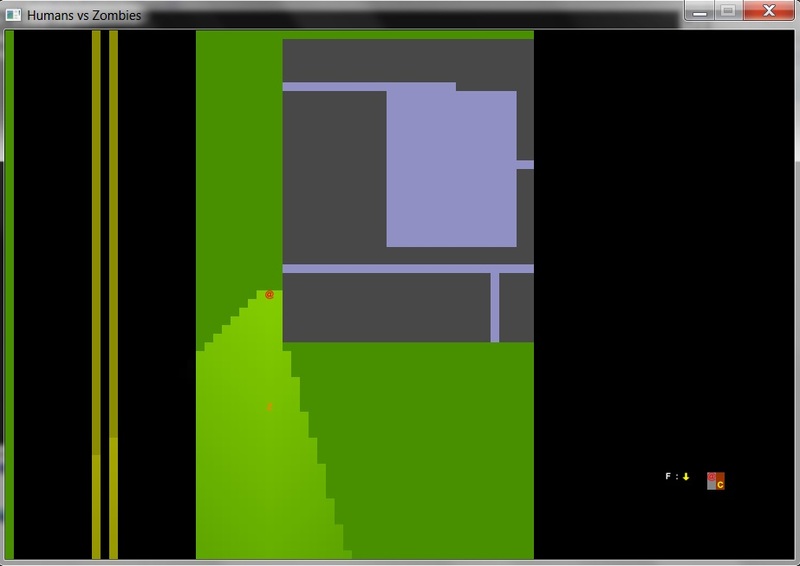 Screen shot of being chased inside a building and my pretty vision system below. Did not get a whole lot done today. Last night I got the map generator done and then got a quest generator finished that tells you where your classes are and lets you win the game after you have been to all of them. Today I did some bug fixes on what I got done yesterday, implemented the ability to move diagonally and made it so that the game keeps track of the direction you are facing. Little actual work got done, but I finished a tvshow I had been watching today and also just got the last expansion to Twilight Imperium in the mail, so I was a bit distracted. Tomorrow I hope to implement both the vision system, making it so you can only see in the direction you are looking, and a basic zombie and nerf gun system done so the game will have a bit of a challenge to it. Some of what I did today lays the framework for the vision system, and I got a good bit of structural work done so hopefully tomorrow will be more successful. Hey all. Its been a while since I posted. I finished my novel in november and have been running my daily pokemon pbp since then which has about 25 active players. Updating because I am working on a new project, and I figured telling people about it and such would help keep me motivated. 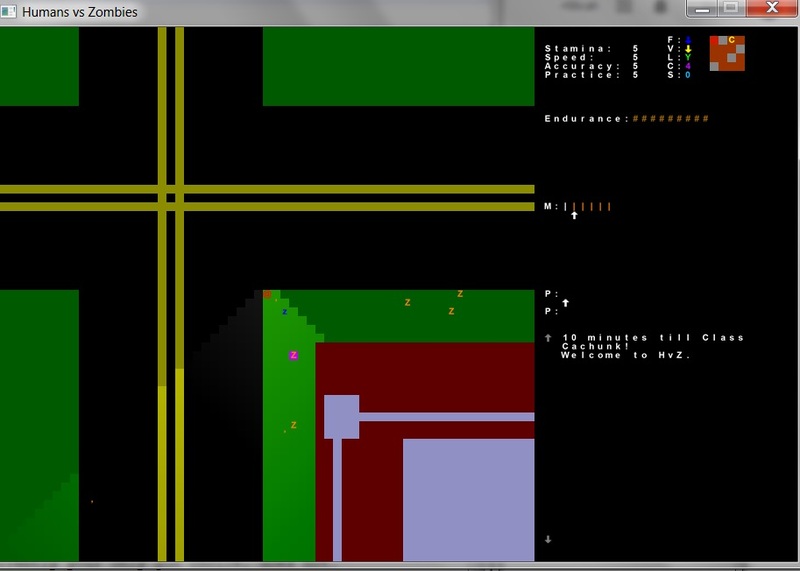 I will be programming a rogue-like game in python. I started today and will be finished by the end of Saturday. I don’t recall if I ever wrote a post about rogue-likes before, but if I did not I will right a post about them once I a have finished up this week. Expect updates and such here. Anyways, I have finished the map generator for my rogue like so far and can actually run around and go inside buildings and such. The theme of this rogue like is HvZ and I will be attempting to simulate the feel of that game as much as possible in a turn based environment. Anyways, wish me luck and hopefully I will have some cool stuff to show off in the upcoming days. You are currently browsing the Walking through the Rain blog archives for March, 2014.